My last post came about because the film had been remade and had initiated a virtual debate about its cinematic quality, and the advisability of remaking films that ought not to be touched. I fell squarely into the anti-remake group; one assumes that the people who see, and like the remake, most probably have not seen the original, and even more possibly, cannot relate to a much simpler time. In any case, the discussion that led to that review also led me to thinking about remakes in general, and reminded me of another classic that was remade (and butchered) - as different from Chashme Buddoor as chalk from cheese. Umrao Jaan Ada, the legendary courtesan of Lucknow. Of course, director JP Dutta screamed himself hoarse that he was not 'remaking' Muzaffar Ali's film, but was adapting the novel on which it was based. Apart from the fact that the original film is deservedly seen as a classic, it is a period film, a genre that I love. It is also a very well-made period film with its meticulous attention to detail. Set in Lucknow in the mid-19th century, the film details both the refinement and elegance of the city, known for attracting men of culture and intellect, and the decadence of its ruling elite. In Faizabad, little Ameeran (Umme Farwa) is being dressed up for her engagement. There is song and merriment and everything is exciting for the young girl, scarcely into her teens. Her father (director Muzaffar Ali in a cameo) had testified against their neighbour Dilawar Khan (Satish Shah), as a result of which he had been sentenced to 12 years in prison. Now released, he wants revenge. He abducts Ameeran, planning to kill her, but changes his mind when his companion offers a better idea - sell the girl in Lucknow. Ameeran is not the only unfortunate girl to be so abducted. In Lucknow, she makes friends with Ram Dei, who was abducted from a fair. A few days later, the girls are sold. Ram Dei is taken into a wealthy family, while Ameeran, dark-skinned (and therefore less attractive) is taken to a high-class kotha, where Khanoum Jaan (Shaukat Azmi) is taken by her innocence. As she remarks to Husseini (Dina Pathak), yahaan nahi bikti toh kahin aur bikti. Husseini takes over the job of bringing her up, and it is here that Ameeran becomes Umrao. After the horrifying ordeal she had been through, Ameeran is happy to acquiesce. She is too innocent to know what the kotha is for, and has no idea that one day, she will be a commodity on sale. At present, Khanoum Jaan's and Husseini's kindness means a great deal to the child who knows she cannot go back to her parents. The very next day, Umrao begins her training in music and dance along with Bismillah, Khanoum Jaan's daughter. It is a world that she would never have known had she remained in her parental home. Time passes, and soon Umrao (Rekha) and Bismillah (Prema Narayan) are two beautiful women who are ready for their presentation to the world of men, the world of elegant and cultured men who have an appreciation of music and dance and poetry recitations. Umrao has also been learning poetry from Maulvi Sahib (Gajanan Jagirdar) who is Hussaini's paramour. Once she begins performing, it is one of her own ghazals Dil cheez kya hai that she chooses for her debut. The emotion the words evoke, and Umrao's very melodious voice attract the attention of a passing young nawab, Sultan Sahib (Farouque Shaikh), while Gauhar Mirza (Naseeruddin Shah), the son of a prostitute and a pimp himself, is besotted by her. Also besotted is a certain Nawab; to pay for Umrao's services, he is willing to sell off part of his property. Nawab Sultan Sahib is enticed to the kotha by Gauhar Mirza who paints such a word picture of Umrao that the young Nawab is intrigued. Umrao performs In aankhon ki masti ke - Nawab Sultan is smitten. Mirza encourages Umrao to encourage the young nawab's attentions - after all, it is raining asharfis (gold coins). So begins a relationship that is based on the Nawab Sultan's penchant for poetry and music on the one hand, and Umrao's ability to please a man on the other (she even claims to have sung In aankhon ki masti ke solely for him, never mind that she didn't know who Mirza was referring to the next day). Slowly, as their meetings grow, their emotions too undergo a change. They are two young people drawn to each other by shared interests, and without really meaning to, they fall in love. Nawab Sultan's love for Umrao pays no heed to the societal restraints that preclude such a relationship. However, an incident at the kotha involving another man sends him away, until a couplet penned by her and sent by Mirza's hand fans the embers of his passion once again. He will never enter the kotha again, but they begin to meet at his friend's mansion. But the blow soon falls - insulted by the Begum's mother-in-law and her servant, Umrao vows never to step into their house again. Unknown to the two lovers, it is the beginning of the end. Nawab Sultan's father informs his estranged wife about her son's relationship with a courtesan. His motives are far from pure - he not only desires Umrao himself, he wants his only son to be married to his young niece. His ex-wife wants nothing to do with him or his family and brushes off his proposal; when he exclaims that do what she will, his son will marry where he wishes, she gets her son married off to her young companion. While Umrao is not too bothered that her lover might marry elsewhere (she is practical enough to know that she can never be his wife), she is still hurt when he comes to invite her for his wedding. In the meantime, Khanoum Jaan has sent Umrao a new admirer - Faiz Ali (Raj Babbar). He is rough and unpolished but he has a kind heart. Hurt to the core by the news of Nawab Sultan's marriage, and sickened by Khanoum Jaan's greed, Umrao agrees to elope with Faiz. Unfortunately for her, Faiz is no nawab. He is a wanted dacoit, and is killed in a police encounter on their way to Kanpur. Umrao has a choice - return to Lucknow and the kotha or go to Kanpur on her own. A chance encounter with Bismillah (who has also escaped the kotha and her mother) gives her the opportunity to set up on her own, where she performs for the local nobility. Years pass, and one day, she is invited to perform a mujra at the home of a wealthy begum on the occasion of her son's birthday. Once there, she meets a face from the past - Ram Dei, the girl who had been kidnapped and sold along with Ameeran. Destiny made her the legal wife of a young Nawab. Umrao's troubles are not yet over. She is discovered by Hussaini and Mirza, who emotionally blackmail her into coming back to Lucknow. When she refuses to stay in Lucknow, Khanoum Jaan offers to let her go after Muhurram. Umrao soon learns that she will never be free of the kotha - at Khanoum's urging, Mirza has filed a lawsuit against her, alleging that she wants to leave him, her lawfully wedded husband. Trapped by circumstances, Umrao gives in, but help is on the way in the unlikely form of the British who have laid siege to Lucknow. As the residents of the kotha make their escape, they stop overnight at Faizabad. Here, Umrao manages to slip away from Khanoum and her guards once again. Once again, her fame precedes her. Staying in the very town of her birth, she receives invitations to perform at private gatherings, one of which seems strangely familiar. This leads her to sing Ye kya jagah hai doston, at the end of which there is a heartbreaking reunion. And another separation. Based on the novel Umrao Jaan Ada by Mirza Mohammed Hadi Ruswa, Muzaffar Ali's Umrao Jaan lovingly recreated 19th century Lucknow. His attention to detail is everywhere - in the elaborate costumes and the exquisite manners of the period, the insistence on traditional instruments for both score and background, even in the accessories on screen - carpets, paan boxes, chandeliers, and so on. His deft direction reined in much of the excesses of usual commercial cinema, while camera man Pravin Bhatt lovingly framed the beauty and the decadence of the Nawabi culture of the era. The poetry-loving culture of 19th century Lucknow is beautifully drawn with several scenes involving mushairas. Shahryar's lyrics (Tamaam umr ka hisaab maangti hai zindagi, ye mera dil kahe to kya, yeh khud se sharmsaar hai) lent its gravitas to Khayyam's score, and the music of the film has rightfully taken its place among the melodies that have withstood the march of time. It won both Khayyam and Asha Bhosle very well-deserved National Awards for the overall music and for Dil cheez kya hai respectively. Unlike the book however, which is written as a personal memoir, and is a flashback, Muzaffar Ali kept to the linear narrative and what deviations he took from the narrative did not take away from the spirit and atmosphere of the novel. While he did change the chronology and emphasise some parts of Umrao's life over others, he left the sub-text (the moral hypocrisy of a patriarchal society and its treatment of women, both well-born and tawaif) intact. Umrao Jaan is one of the best feminist films to come out from under a male director's baton. Rekha had possibly never been framed so beautifully as she has been here. An intelligent (and excellent, if erratic) actress, she gave one of her career-best performances as the eponymous Umrao. Her face and eyes show the trajectory from hope to despair, as she realises that she will never be free of the exigencies of her life. The disillusionment is never as vivid as when she sings Yeh kya jagah hai doston? Her eyes reveal her weariness, her desolation. In fact, right through the film, she lets her eyes do a lot of the talking. That, and her fantastic voice modulation (with that carefully cultivated huskiness), including her perfect Urdu diction, makes you realise just how underrated (and underutilised) an actress she truly was. In comparison to Rekha, the others were supporting characters, but Muzaffar Ali drew them with as much detail as he painted the titular Umrao. Farouque Shaikh was perfectly cast as the the spineless Nawab Sultan. He brought in just that touch of spinelessness - not a knave, but definitely a wimp - that breathed life into a character who cannot withstand his family's (and society's) pressure to marry someone of his own station. Naseeruddin Shah came in as Gohar Mirza, the pimp who adores Umrao from afar, and lives off her earnings. Mirza is not a bad man at heart, but he is also forced by circumstances to do what he does. A fact that Umrao also understands. Raj Babbar is Faiz Ali, a dacoit who is besotted with Umrao, and is willing to make her his wife. Special mention, of course, should be made of Shaukat Azmi who plays Khanoum Jaan, the greedy and exploitative madame of the brothel. Ending soon after the siege of Lucknow in 1856, the film compresses much of the narrative in the novel without losing the plot. Was there really such a person as Umrao Jaan Ada or was she just a figment of Ruswa's imagination? The novel, as written, was a personal memoir, a dialogue between the author and the courtesan, whom the author had supposedly met during a mushaira. Enamoured by her poetry, he convinces her to narrate her life story, which she eventually edits. Scholars are conflicted even today. On the one hand, there aren't any written records from the period to show such a person existed - and surely, there should be, considering she was a poet in her own right. On the other, there was a dacoit named Faiz Ali, and there are a few British documents that talk of a courtesan Azizan Bai who claimed to have been taught by Umrao Jaan herself. Whatever be the truth, the film stands on its own merits, and is still as watchable as it was when it was first released over three decades ago. ps: For those curious about the courtesans and their role in Indian society, here is one article about the real courtesans. kabhi fursat mein kar lena hisaab, aahista, aahista. What I meant to say was, Umrao Jaan- great story, excellent performances by all concerned ... amazing music and lyrics. Leaves me cold. Because of Rekha. A great fan of her personally -lived life on her terms. But she represented the overly made up, "looking statuesque == gravitas in acting and diva" theory that Ash Rai followed 2 decades later. OTT, OTT, OTT! 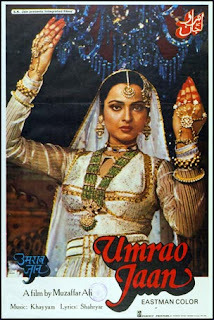 Everything about Umrao Jaan was wonderful, the songs, the direction and of course the acting. I remember I had not seen the film but had seen 36 Chowringee Lane and like everyone else I too felt that Jennifer Kendal deserved the award. Later I saw Umrao Jaan on television and I changed my mind, Rekha definitely deserved this award, i really couldn't fault her performance. No, no no, please do not compare Rekha with Ash. Ash is a competent enough actress when she has a good director, but Rekha was a fantastic actress when she wanted - look at Ghar, for instance. Thank you for reviewing this, Anu, and for that bit of trivia at the end regarding the existence of Umrao Jaan. I've never read Umrao Jaan Ada, but you tempt me. Madhu, I stay away from most remakes. And truth to tell, JP Dutta didn't inspire me with any faith in his ability to make it well. Even as the motivation to take up one more, and that too back-to-back the previous one, original in the ’remakes’ genre is explained very well in the introduction of the article, what can be considered as pleasant (and thoroughly enjoyable as well) surprise is the fact the author has one of oft-discussed film. I loved the previous one and didn't mind Aishwaraya's. The filmi world is so artificial and speak so much English in their interviews and films that it is very difficult to relate to their sudden changes which doesn't exclude their modern body language. That was the main flaw of the later UJ. Both Abhishek and Aishwaraya are so anglicised (as most stars) that one couldn't relate to it as much as to Rekha and Farookh etc. Aishwaraya of course looked too beautiful, and made up (as Rekha did too) which shouldn't go against the profession they were in anyway, I guess. The details of 19th century Lukhnow were indeed so well brought about. I think I'll watch this again soon. :-) Thanks for the review Anu. Thank you so much for the appreciation, Ashokji. I'm glad you enjoyed the review and the article. Aishwarya's beauty, I think, is more of a curse than a blessing. One cannot look past it. [Grins]. My reading has reduced so much these days, it's a shame. Thanks for reading, Yves, and I'm glad you liked it. As for the quality of the film, the DVD companies have a lot to answer for, don't they? What a gem of a film. Excellent performances, heavenly melodies, a story well told. Must watch again. I have an audio tape of the film's songs and they are often heard in the kitchen as I cook dinner. That and the ones from Bazaar (on the other side of the same tape). This is a lovely review of a lovely film, which I am never tired of watching again and again. Some nuances I remember very differently. I didn't see Faiz Ali (Raj Babbar) as 'kind hearted'. To me he appeared as selfish as others who exploited Umrao Jaan. I think there is something in his eyes, or his facial mannerisms, which make it appear as if he has never grown out of Insaaf Ka Tarazu. Same with the pimp Gauhar Mirza (Naseeruddin Shah). When he stoops down to use a false legal case on a hapless Umrao Jaan, he appears quite mean, and not helpless on account of his circumstances. I can grant Farooq Sheikh is a prisoner of his circumstances. Besides Ye kya jagah hai dosto, another song that gives me goosebumps is Justjoo jiski thi. A lyrical beauty permeates the film throughout, which is on account of Muzaffar Ali himself being a man of great aesthetic taste across literature, music and painting. I have steadfastly refused to see the Abhishek Bachchan-Aishwarya Rai version, I cannot visualise any other Umrao Jaan. This is one film which should be left untouched. Thank you, SoY. I'm not seeing Faiz as a benevolent man - like all men (in the film) he is exploiting her too. But he seems to genuinely like her, and his offer, be it what it is (and Umrao has no delusions), is honest. Mirza, is both exploiter and exploited. He is not beyond emotional manipulation, but he is so much under Khanoum's control that he cannot but do as she asks. He is mean, yes, but he is not evil. It was Nawab saheb who made me feel like choking him - of the three men, he is the one who is genuinely in love with Umrao. And he doesn't make a push to be with her at all. Yes, he is a prisoner of the social constraints of the time, but he is so, so spineless! I ask more of my men than jelly for a spine.